As a budding trainee UI designer of no note whatsoever, I can vouch for the amount of knowledge that you must cram into your skull to become a great pixel-artist. To help get you started, we've teamed up with Train Simple, the Adobe-authorized trainer, to give you over 4300 hours of tutorials for $79 — that's 84% off. 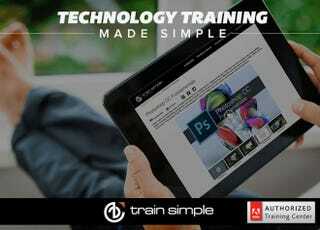 Train Simple is the official Adobe trainer for companies like Disney, Nike, NBC, Intel, and more. In all, these courses cover Photoshop, Illustrator, InDesign, Lightroom, Flash, ColdFusion, Muse, Edge, DreamWeaver plus all the fundamentals of modern web design, so this package has you pretty much covered whatever your flavor of design is. Courses for beginners to advanced users. Print a certificate of completion. Watch movies and courses at your own pace. All course files included with membership. This purchase is good for all current and future courses. Please note that purchases are final — we can't offer refunds. While you folks can probably find cheaper courses out there that cover the same stuff, we think that the Adobe-approved quality together with lifetime access makes this bundle great value. If you'd like to take a closer look, click the link below.